Today, I wanted to try and finish a prototype of Adventure Town. One sit down session where I hustle my tuchus off and come out of it with something I can present like a real game designer. I honestly feel bad about how long it’s taken to make Adventure Town because part of the point of it was to make something I could hammer out in less than a month as a side-project and distribute freely to my Patreon sponsors as a purely digital product. Still, what is experimentation if not for the experiment! Nonetheless, progress. I sat down and tried to think about what more I needed to finish Adventure Town’s first printing. The systems are all in place, really, for what I consider a ‘basic run’ of the game. The system of Adventure Town is a little bit like a sort of Machi Koro like game. You buy parts of the town, and then adventurers come to town, spend their money, and the businesses in town react to those adventurers. They’ll give you money, or prestige, or maybe they’ll work on your personal quests. There’s the common sheet, your personal sheet, and then the game has dice and cards. The idea is that for a print and play game, the cards are easily made and reused for each game, and there aren’t many of them – maybe 25 or so. These cards are all meant to represent adventurers that come to the town at the end of each turn, and that means the card space is going to feature some visual stuff, a picture of the adventurer so that people can focus on that character and know when they show up. So, ideally, they want to be pretty diverse and distinct from one another. I don’t want to spend a ton of money or time on Adventure Town. I have some art assets I can use already, and now I’m wondering if I should use existing art assets. 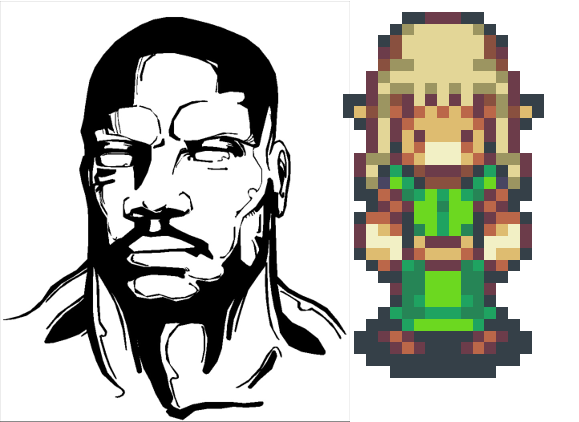 With that in mind, I’m going to ask my Patreon subscribers for more specific opinions, but the basics are am I going to use the art of FinalbossBlues, which is pixelly, and make the game more like running a JRPG town, or will I use the ink art of the Terrible Character Portrait Pack? We’re in what some people are calling a Golden Year for roll-and-write games, which is nice but I’m trying to not let what those games are doing influence me too much. Some of the things you can do with good production values include booklets that change one another, or sequential pages or rules changes, while I’m trying to make a game you can print out and conveniently. Still, because I have free distribution and production costs (more or less) I can afford to give players a lot of options if making those options is relatively easy. And thus we come to my next thought – offering multiple town maps. The first thought was using cards to represent the town, but part of the point of this game design is to make it so players can draw on and deface the board itself. I was thinking I might want to allow – if the design allows for it – oddball things like being able to blow up or change rules on some locations. But I’m getting distracted. The point is: Card based board is not an option. Especially because the point of the board is to be replaceable with a simple printing! We’ll talk more about alternate board stuff once I’ve printed out and played with some more boards!